Congress enacted the Clean Water Act ("CWA" or "the Act") "to restore and maintain the chemical, physical, and biological integrity of the Nation's waters." One of the mechanisms adopted by Congress to achieve that purpose is a prohibition on the discharge of any pollutants, including dredged or fill material, into "navigable waters" except in compliance with other specified sections of the Act. In most cases, this means compliance with a permit issued pursuant to CWA §402 or §404. The Act defines the term "discharge of a pollutant" as "any addition of any pollutant to navigable waters from any point source" and provides that "[t]he term `navigable waters' means the waters of the United States, including the territorial seas[,]." In Rapanos, the Supreme Court addressed where the Federal government can apply the Clean Water Act, specifically by determining whether a wetland or tributary is a "water of the United States." The justices issued five separate opinions in Rapanos (one plurality opinion, two concurring opinions, and two dissenting opinions), with no single opinion commanding a majority of the Court. Four justices, in a plurality opinion authored by Justice Scalia, rejected the argument that the term "waters of the United States" is limited to only those waters that are navigable in the traditional sense and their abutting wetlands. However, the plurality concluded that the agencies' regulatory authority should extend only to "relatively permanent, standing or continuously flowing bodies of water" connected to traditional navigable waters, and to "wetlands with a continuous surface connection to" such relatively permanent waters . Four justices, in a dissenting opinion authored by Justice Stevens, concluded that EPA's and the Corps' interpretation of "waters of the United States" was a reasonable interpretation of the Clean Water Act. When there is no majority opinion in a Supreme Court case, controlling legal principles may be derived from those principles espoused by five or more justices. Thus, regulatory jurisdiction under the CWA exists over a water body if either the plurality's or Justice Kennedy's standard is satisfied. Since Rapanos, the United States has filed pleadings in a number of cases interpreting the decision in this manner. The agencies are issuing this memorandum in recognition of the fact that EPA regions and Corps districts need guidance to ensure that jurisdictional determinations, permitting actions, and other relevant actions are consistent with the decision and supported by the administrative record. 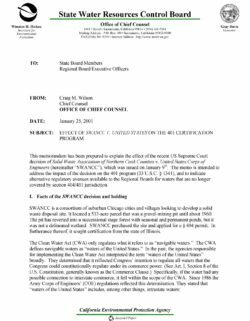 Therefore, the agencies have evaluated the Rapanos opinions to identify those waters that are subject to CWA jurisdiction under the reasoning of a majority of the justices. This approach is appropriate for a guidance document. 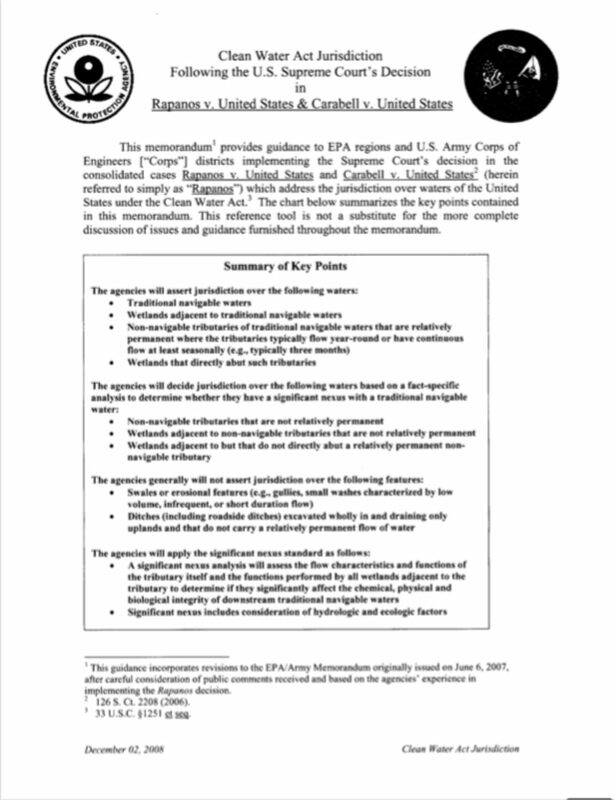 The agencies will continue to monitor implementation of the Rapanos decision in the field and recognize that further consideration of jurisdictional issues, including clarification and definition of key terminology, may be appropriate in the future, either through issuance of additional guidance or through rulemaking. This memorandum has been prepared to explain the effect of the recent US Supreme Court decision of Solid Waste Association of Northern Cook Counties v. United States Corps of Engineers (hereinafter “SWANCC”), which was issued on January 9th. The memo is intended to address the impact of the decision on the 401 program (33 U.S.C. § 1341), and to indicate alternative regulatory avenues available to the Regional Boards for waters that are no longer covered by section 404/401 jurisdiction. 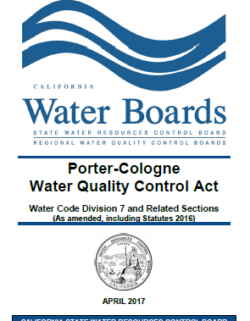 This pamphlet contains excerpts of the Porter-Cologne Act and other related Water Code sections. The State Water Resources Control Board publishes this collection as part of its public information program. This booklet is provided as a public service. 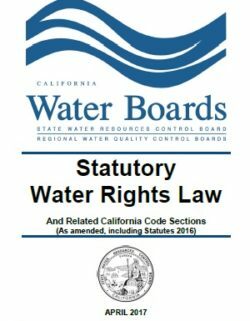 The State Water Resources Control Board publishes this collection of California statutes pertaining to the law of water rights as part of its public information program. This booklet contains sections from the California Constitution, the California Water Code, and other related codes which affect water rights decisions. This booklet is provided as a public service. It contains only excerpts of the Water Code. While every effort is made to assure accuracy, persons should consult the official version of the California Code when making legal decisions. The California Legislative Counsel maintains the official code, which is accessible on the Internet at: http://leginfo.legislature.ca.gov/faces/codes.xhtml. In addition to the statutes contained in this booklet, decisions of the State Water Resources Control Board are guided by case law. A listing of major recent decisions is included. In general, the statutes contained in this booklet govern the acquisition and exercise of rights to reasonable and beneficial use of surface waters (and of groundwater flowing in known and definite channels) by priority of appropriation initiated on or after December 19, 1914. That is the effective date of the Water Commission Act, which is the origin of many of the water right provisions of today’s Water Code.